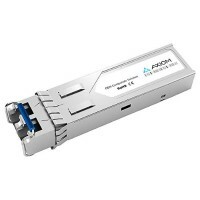 The Axiom 1000BASE-LX/LH SFP operates on standard single-mode fiber-optic link spans of up to 10 km and up to 550m on any multimode fibers. Axiom's Gigabit Interface Converter (GBIC) is a hot-swappable device that allows a fiber optic system to interface with a Gigabit Ethernet port. GBIC's are the most price effective way to adapt your system to the newest communication networks.